The IVEL Ultra is a Croatian computer made by Ivasim Electronika. Its creator was Branimir Makanec. They were made in a little city near Zagreb called Ivanic Grad. 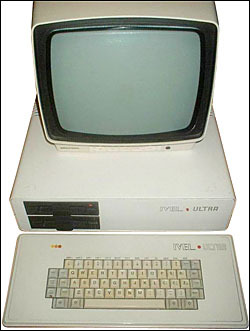 The main characteristic of the Ivel Ultra is to be compatible with the Apple II. On top of that, the Ivel Ultra has a second processor, a Zilog Z80, mainly used to offer CP/M compatibility. The were different versions of this computer. The brown version is the oldest model (made in 1984-1986) and the white version is newer (made in 1987-1990). see more Ivasim elektronika Ivel Ultra Ebay auctions !